As previously announced, Noront recently acquired the highly prospective Butler and Sanderson properties from Macdonald Mines increasing the Company's claim blocks in the Ring of Fire from 375 claim units to 522 claim units (See Figure 1 below). These properties consist of two separate blocks of claims. The Butler property (77 claim units) covers a very prolific belt of felsic volcanic rocks which hosts four known zinc-copper rich volcanogenic massive sulphide (VMS) occurrences. Please see section below titled: Zinc-Copper Strategy for further detail on the VMS assets. 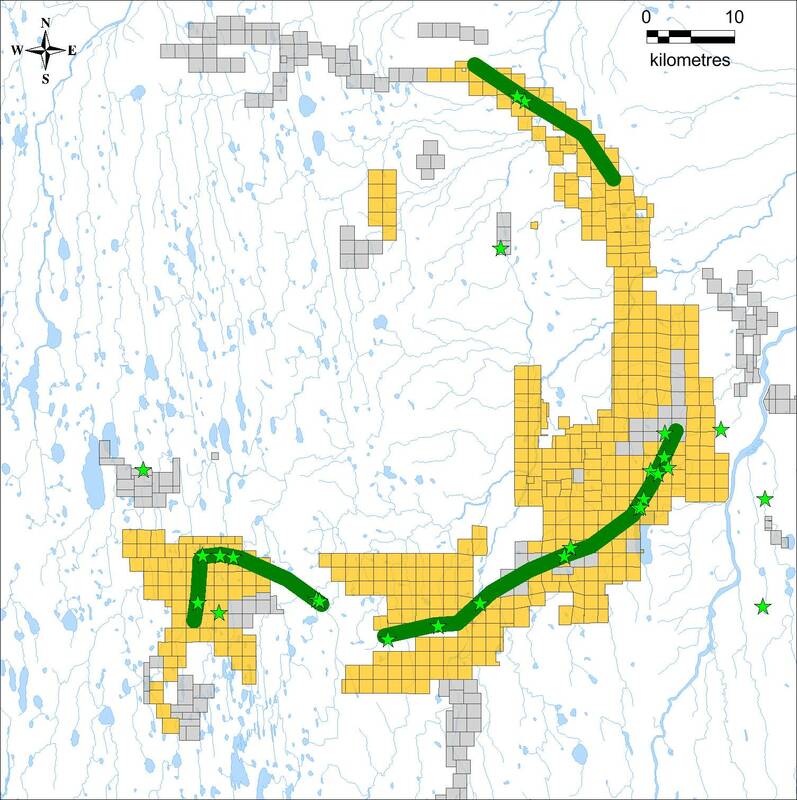 The Sanderson property (70 claim units) covers a large ferrogabbro intrusion (the "Big Mac" intrusion) and possible footwall ultramafic intrusion similar in scale to the Black Thor intrusion and which is prospective for nickel-copper as well as chromite deposits. Noront is currently exploring for nickel-copper-platinum-palladium deposits along strike from its Eagle's Nest deposit. A number of prospective geophysical targets have been generated and drilling on one of the most compelling anomalies has begun. The Company is drilling a geophysical anomaly identified at depth, which could represent a significant sulphide conductor. The anomaly is proximal to the Eagle's Nest deposit at a depth of approximately 750 meters. Modelling indicates the cause of this anomaly could be a conductive body with a strike length of 800 meters, depth extent of 500 meters and a thickness of 50 meters. Cyr Drilling International and Webequie First Nation will conduct the drill program in a joint venture, providing revenue and job opportunities to First Nations communities. At the request of the Webequie community a ceremony was conducted by an elder and a drum group to ensure minimal disturbance to the land and water and for the health and safety of the workers. This event is an example of Noront's approach to working with local communities and respecting their traditional values. As previously announced in the Company's August 8, 2016 press release, Noront expects the provincial government to make a joint announcement with local First Nations regarding plans for a shared regional access road before the end of this year. A recently completed community-led study is one element that will inform the planning of an integrated road solution which will link local communities and provide transportation access to Noront's Eagle's Nest mine. The Company believes that with the federal and provincial governments working cooperatively there is a unique opportunity to achieve a breakthrough, in the near-term, unlocking the benefits of the Ring of Fire development for all stakeholders. Noront will now begin to compile the extensive series of zinc and copper rich VMS assets it has amassed and generate an aggressive exploration strategy to fully explore their potential. The Company has 13 zinc-copper occurrences under its control, ranging from early stage showings on the Butler property to NI 43-101 compliant resources on the McFaulds property (Figure 1). The McFaulds and Butler felsic to intermediate volcanic belts, with a strike length of over 50km will be the focus of initial VMS exploration under this strategy (Figure 2). Significant exploration work on the McFaulds property slowed after 2007, when the Company's focus shifted to nickel-copper-platinum-palladium exploration with the discovery of the high-grade Eagles Nest deposit. 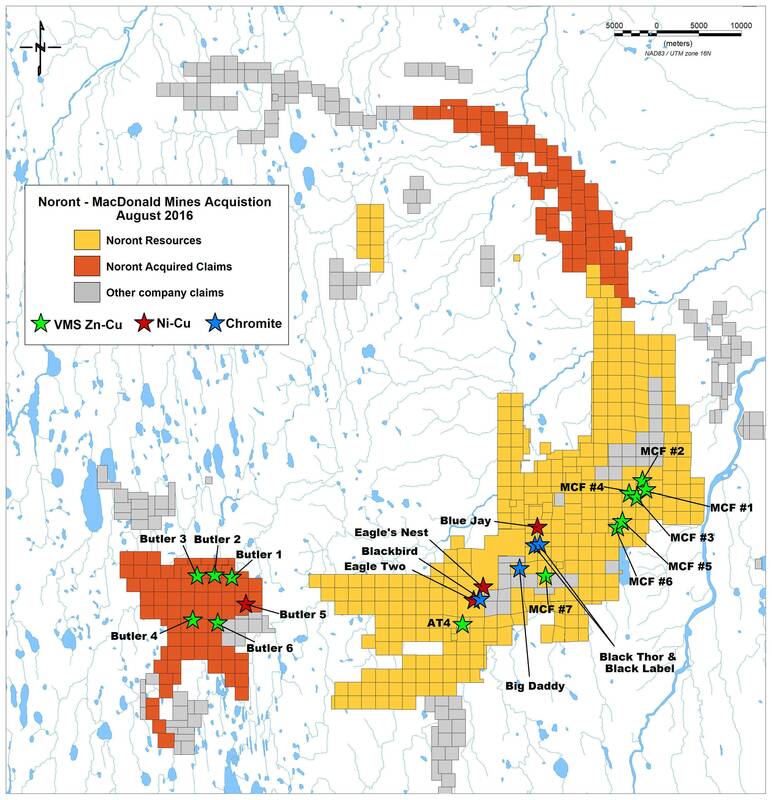 Noront believes there is still significant potential to increase the known resources at McFaulds and to discover additional high-grade copper-zinc VMS deposits on both the McFaulds and Butler properties.